Who you are is the most important. Your relationship with Jesus is most important. Because you know Jesus, you will make a difference in the lives of your young people. As we pass on the faith (at home and at the parish), more is caught than taught. 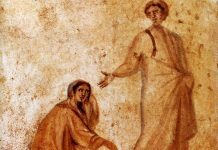 It’s not that “knowing our faith” isn’t extremely important; we always have an imperative responsibility to continue our learning and growing. At the same time, all the preparation and study in the world will never give us all the answers to every question (and that’s exciting, for there is always more to learn). It’s all right to say, “I’m not sure, but I’ll find out, and we’ll talk more about it next week.” Encourage your learners too to do research and to talk to their parents and grandparents to find the answer. 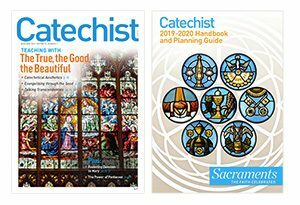 TO DO» Enroll in a class, participate in a parish or diocesan workshop, or read a book to deepen your understanding of the faith. TO PRAY» God of mystery, open my eyes, my ears, and my heart to learn more deeply and to teach more earnestly. 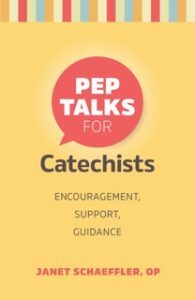 Excerpted from Pep Talks for Catechists, by Janet Schaeffler, OP. 2015. Published by Twenty-Third Publications. Used with permission. All rights reserved. Next articleCongrats to our Grand Prize Winner — Faith Reilly!